I am in love with this lasagna soup. Totally smitten, kitten. I served the soup with garlic toast and a dollop of sour cream. 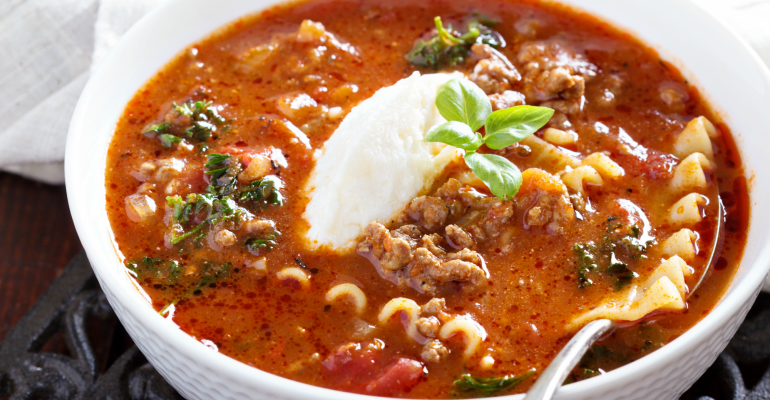 I love eating classic lasagna with sour cream so I thought adding it to my soup would taste great. Guess what? It did! That cheesy concoction at the bottom of the bowl is like opening a present on Christmas morning, y’all. For a slow cooker version of this soup, be sure to check out my Slow Cooker Lasagna Soup with Chicken and Mushrooms! Heat olive oil in a large pot over medium heat. Add sausage, breaking up into bite-sized pieces, and brown for about 5 minutes. Add onions and cook until softened, about 6 minutes. Add garlic, oregano, and red pepper flakes. Cook for 1 minute. Add tomato paste and stir well to incorporate. Cook for 3 to 4 minutes, or until the tomato paste turns a rusty brown color. Quick Tip: To serve, place a dollop of the cheesy yum in each soup bowl, sprinkle some of the mozzarella on top and ladle the hot soup over the cheese.